Amongst huge fanfare, Honda Motorcycle and Scooter India Pvt. Ltd today announced the national winner of #HondaNAVicustomania. 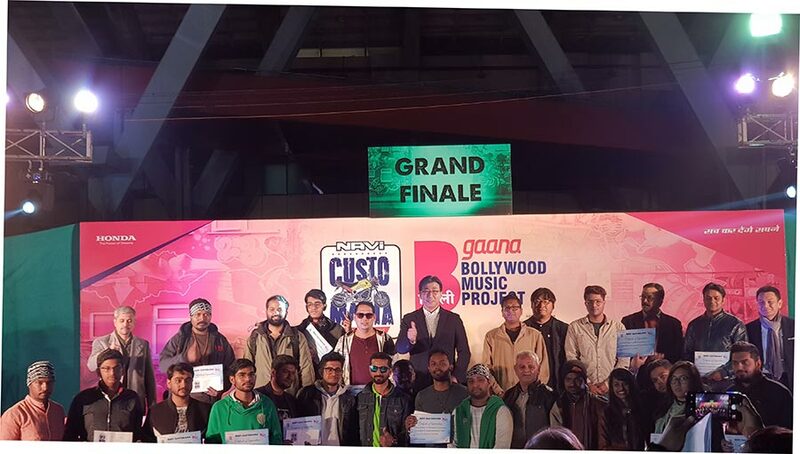 The Grand Finale was concluded at high voltage Bollywood Music Project 2018 where thousands of youth congregated to witness Bollywood music performances and saw the FUNtastic NAVi in it’s full glory. At the grand Finale the winners were felicitated by Mr. Minoru Kato, President and CEO, Honda Motorcycle and Scooter India Pvt. Ltd. Launched in 2016, NAVi’s design statement in its standard form, is FUN TO SEE and pure FUN TO RIDE. Providing endless possibilities in expression & Customization for the young customers – NAVi is designed in such a way, that it opens up a significant opportunity to modify & customize it to suit one’s taste. And therefore pure FUN to Create. NAVI’s unique design provides endless possibilities in customization for young customers. Celebrating the spirit of customisation, NAVi Customania is a platform for youngsters to project their self-expression on two wheels. What is most interesting is to see is the trend of customisation being developed, not just in metros but smaller cities as well. We congratulate the well deserving winners and look forward to showcase their custom NAVi’s at Honda 2Wheelers India pavilion @ Auto Expo 2018!! Battling it out amongst the Top 24 (2 winners from each city), Grand Finale winner Mr. Dhananjay Parihar received a prize money of Rs. 2 lacs along with a once in a lifetime opportunity to showcase his custom NAVi’ inside the Honda 2Wheelers India pavilion at Auto Expo 2018. Mr. Ashiq Joseph Thomas from Kottayam finished runner-up and won Rs 1 lac. The feeling that my custom NAVi will be showcased at the Auto Expo has still not fully sunk in. #HondaNAViCustomania gave me an incredible chance to exhibit my creativity to the world. The guidance during construction phase via the mentor sessions was very helpful and provided my design a new dimension. I appreciate and thank Honda 2Wheelers India for providing me with this platform. Not just for NAVi owners, Honda also organised a separate web and application edition of the contest, especially for the tech savvy young generation. Mr. Jyugaandh Veer Singh and Mr. Lalith Ankala were announced the winners of the web and application-based editions respectively which alone saw more than 5500 participations.